Way back in March I posted a delightful little .eps file that included some vector mountains that I had been using for my reconstruction of the Yavmir map. Today, I present to you another useful tool for prospective map-makers: an .eps file that includes some tree vectors for use in map projects. I just finalized these designs yesterday, and you can see a quick forest that I plotted out in the image below. My wife commented that these trees look like they are “on fire,” so I have taken to calling them fireball trees. They match the minimalist design of the mountains, utilizing a small grayscale palette to create a simple, hand-painted style. There are four unique trees in total, arranged in a little over a dozen easy-to-use groupings. Just layer them from back-to-front on your map and you’re good to go! Many thanks to Telecanter for isolating the trees and posting them on his blog. 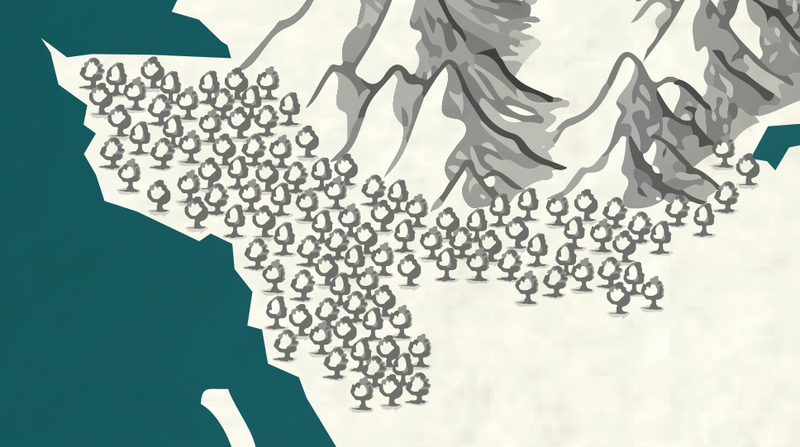 He nabbed the original artwork from a public domain map from the 1600s, so like every other map resource I post on the blog, you can use these trees 100% free of charge. which, I… well, had to guess. But I’m glad you have a system for it at least! Just had to leave a comment, Thanks so much for posting these! These along with the mountain ones are a treat to work with in Illustrator for someone who’s still figuring things out.